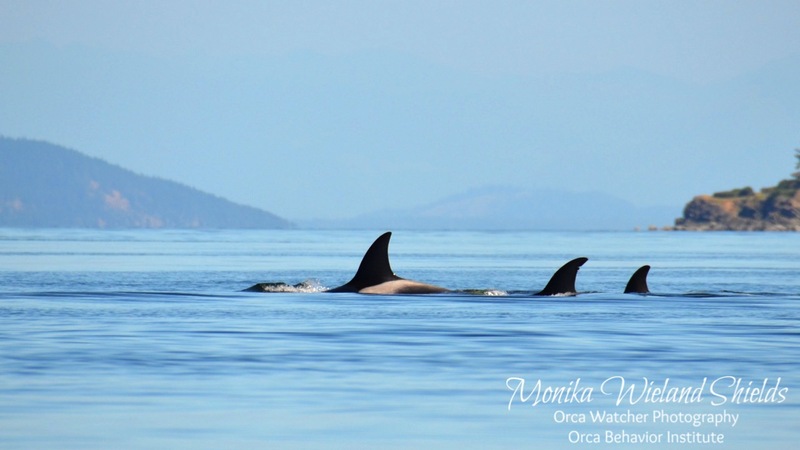 The first two weeks of July slipped off the calendar with no sightings of Southern Resident Killer Whales in inland waters, which is very unusual. 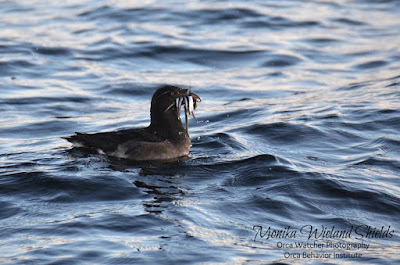 Even with the "new normal" of drastically reduced visits from them in the spring months of April through June, in recent years sightings have at least picked up starting at the beginning of July. Not so this year. 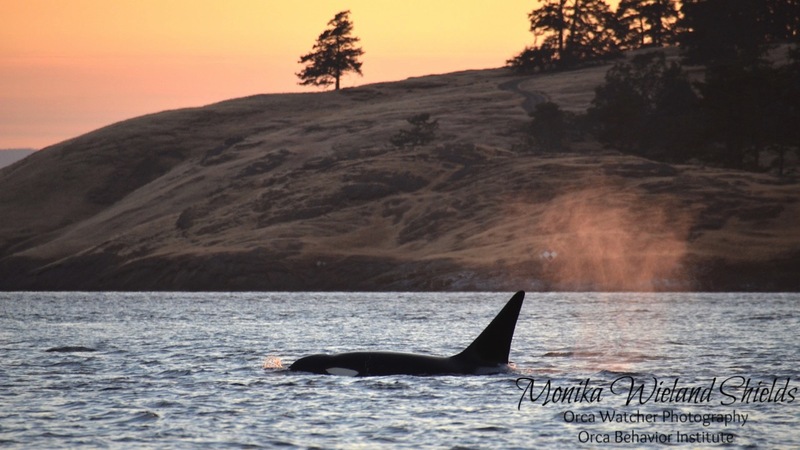 We continue to hope that wherever they are hanging out they are finding plentiful food, but in the meantime another amazing phenomenon is unfolding: the marine-mammal transient killer whales are seemingly taking over. 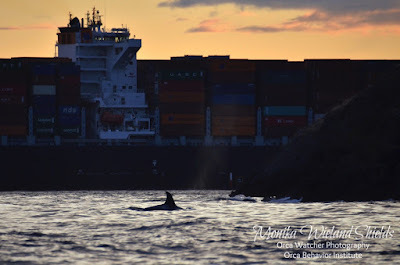 Not only have they been around on a nearly daily basis, but there have usually been multiple groups of transients around this month at times numbering more than 30 whales. It has also become the "new normal" to see lots of Ts in the spring (April-May) and late summer (August-September) but having this many of them around in June and July is also unprecedented. 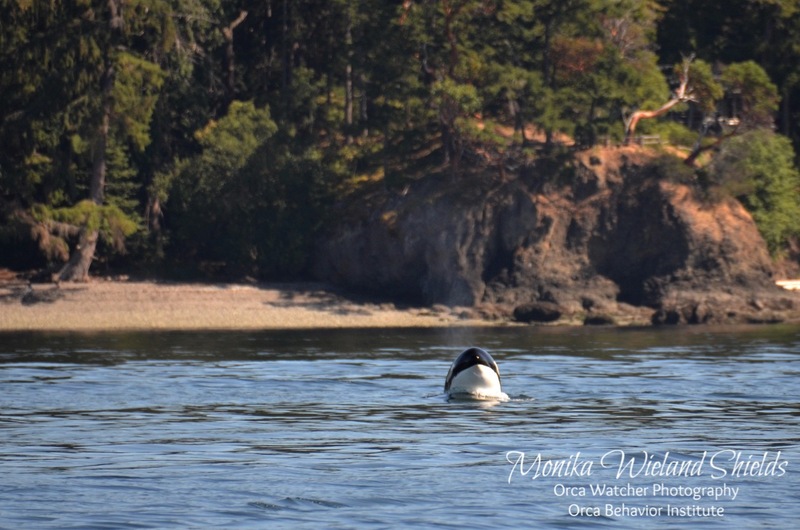 It's been amazing to see, and I've very much enjoyed the opportunity to get to spend a lot more time with this other population of orcas of the Salish Sea. It's hard to believe when I first started visiting the San Juans it took four summers here before I ever even saw transients for the first time! 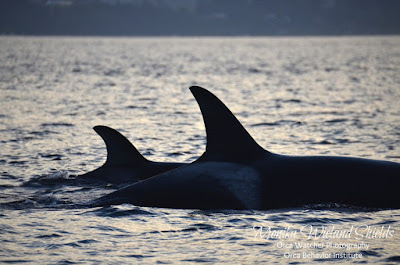 On the evening of July 8th we headed across Haro Strait to Sidney Island, BC to hang out with the T49As, who took up residence near the San Juan Islands for more than a week. 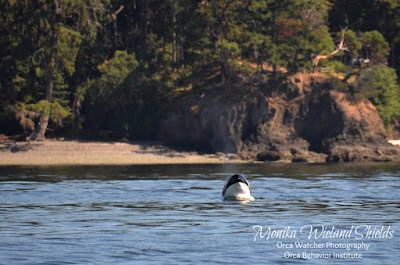 When we first got there they were doing long dives with very sporadic surfacings, making them hard to track, but shortly thereafter they hunted a harbor seal and proceeded to hang out for more than half an hour. 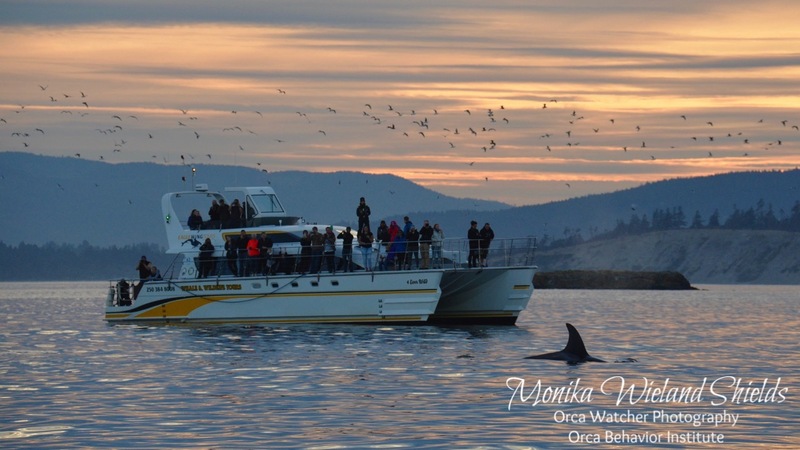 All the boats were shut down and it was a peaceful atmosphere as we watched the whales go about their business. 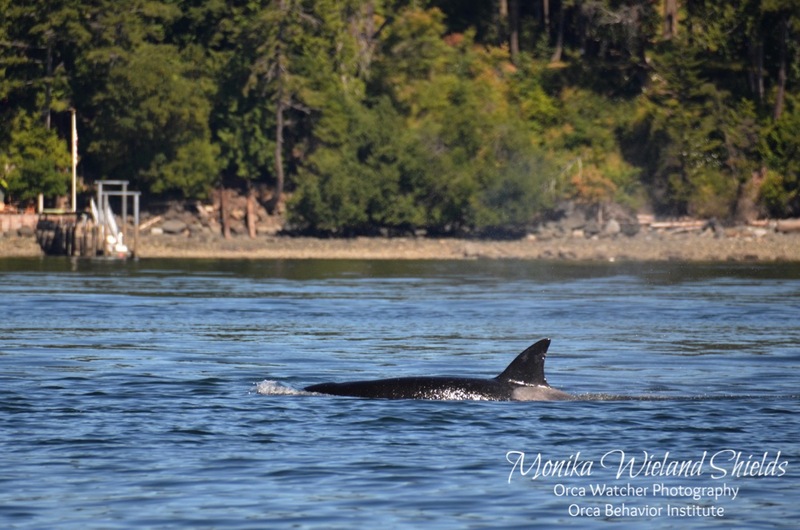 If I learned one thing about the T49As in our multiple encounters with them in July it's that they are not at all boat shy - in fact, rather boat curious. 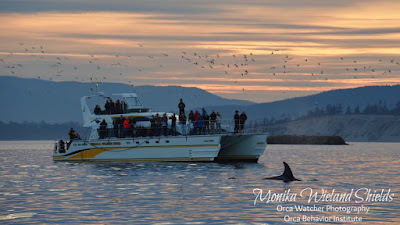 Every time I saw them they went over to check out at least one boat, and this evening was no exception as in their circling they made a close pass to pretty much everyone who was there drifting in the current. 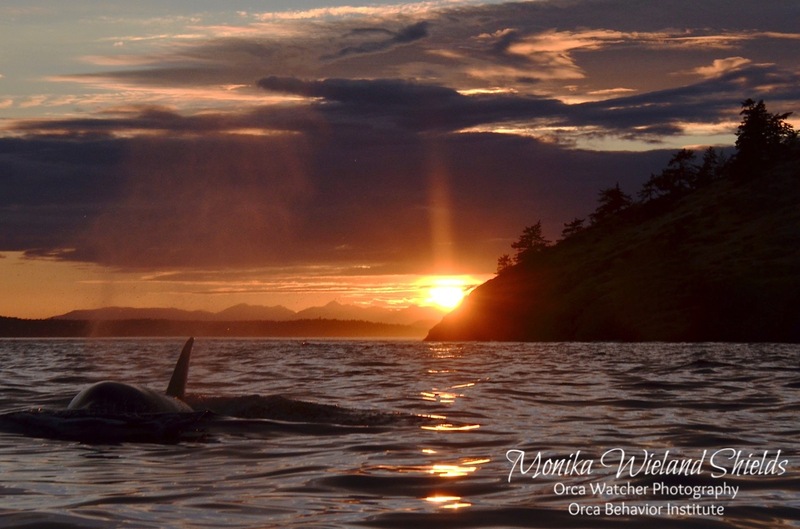 Just as the sun set, the light got even more amazing. 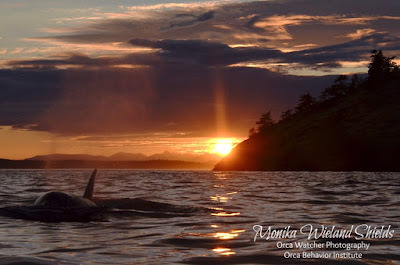 In a perfect magical moment, the whales swam right into the orange light as a flock of sea gulls took off behind them. 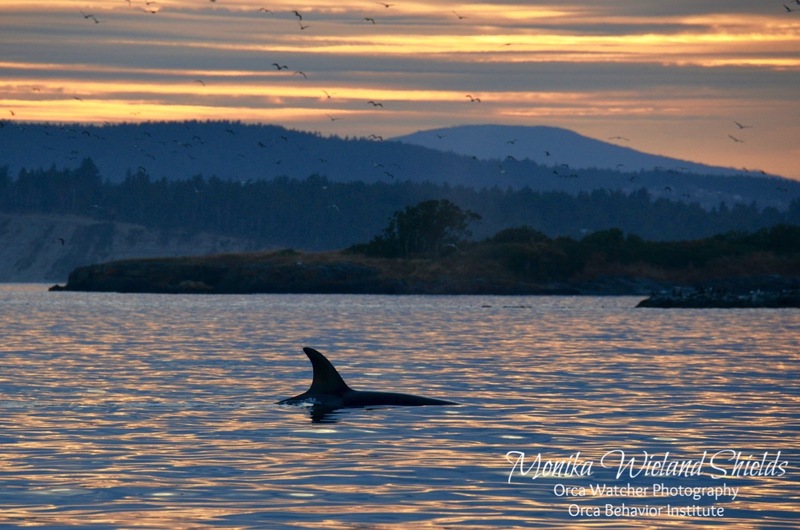 Most of the largest groups of transients lately have been hanging out in Rosario Strait or the Strait of Georgia, generally a bit too far for us to go by boat. 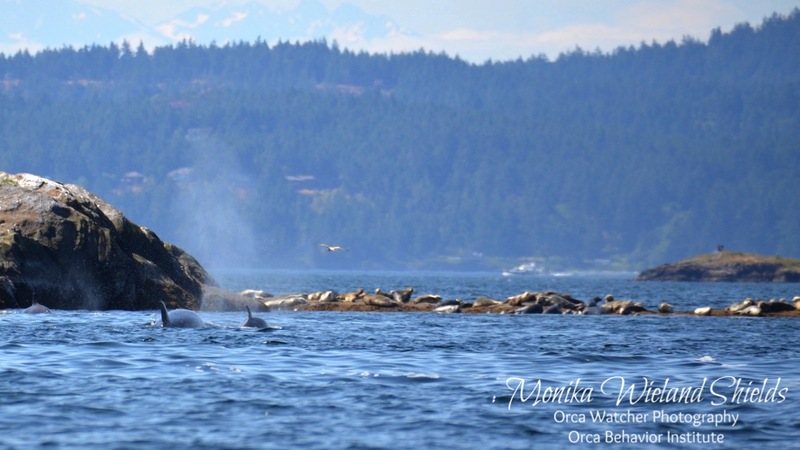 On July 11th, however, one group made up of 10 whales (T36, T36Bs, T37A1, and T99s) came up San Juan Channel past Friday Harbor and then headed up President's Channel. 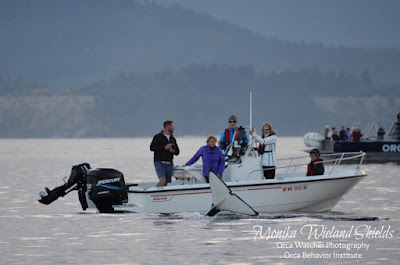 After seeing them from shore in San Juan Channel, we hopped onto the boat and caught up with them at the north end of President's Channel, following them to Sucia Island (the furthest east we've ever been in the boat!). 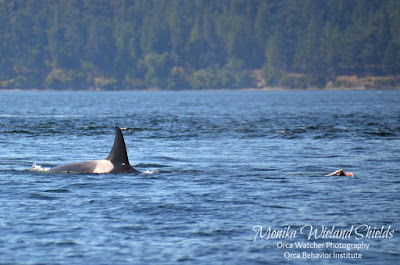 T37A1 is a very interesting individual, as he/she has dispersed from their matriline the T37As at a very young age. Dispersal is not uncommon in transients, as in some cases both sons and daughters will leave their mother's side, but usually only when they're adults, when the group size is large, and for the case of females when they start having their own offspring. 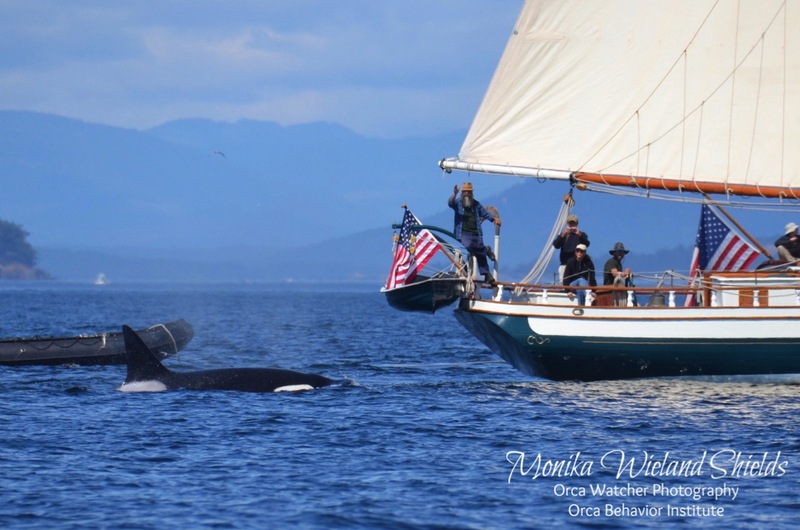 Just 10 years old this year, this whale regularly flips between traveling with different family groups. 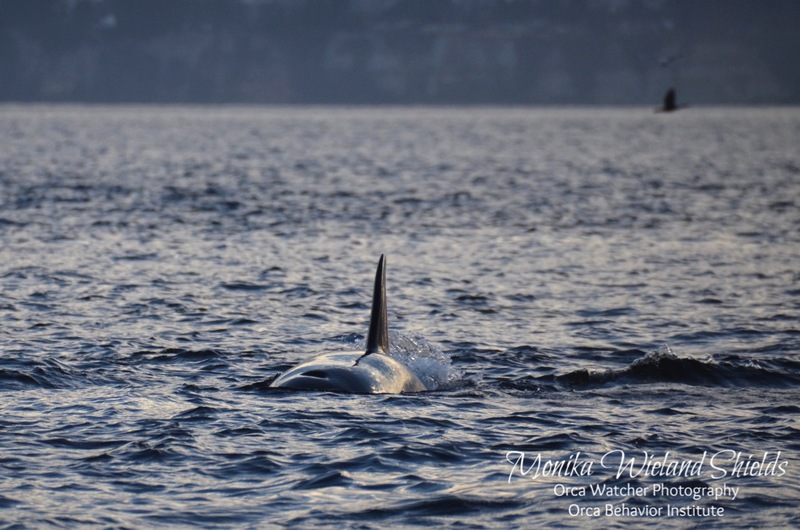 His/her appearance is also distinct: a very short, broad fin that's sporting some new scarring this year. After this group made a kill, they rounded Point Doughty on Orcas Island and grouped up, traveling in a slow-moving tight group through, again, brilliantly colored waters. 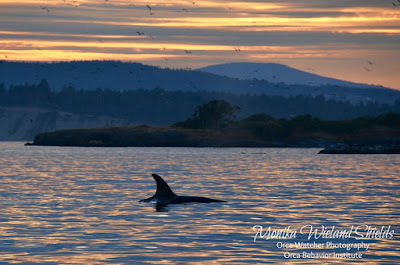 The light was fading but with the whales so close we had to try to catch them from the boat. Enabled in part by them making a turn in our direction, we were able to briefly catch up with them for another sunset encounter. That Friday evening proved to be the start of a triple header for the weekend. 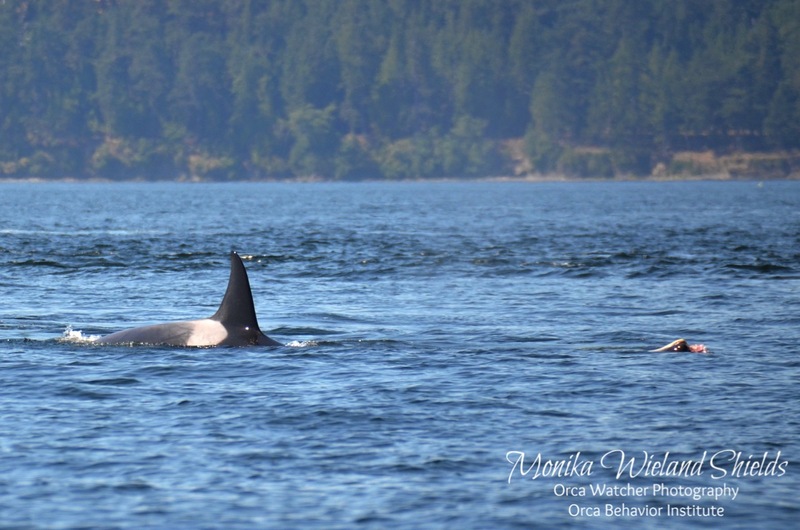 On Saturday morning (July 15th), we met up with the T34s, T37, and T37Bs near Flattop Island. 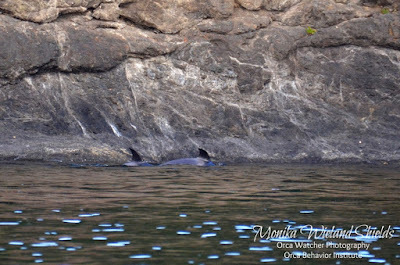 Soon after we arrived they made an apparent pursuit on a harbor porpoise, though it wasn't clear if they got it. 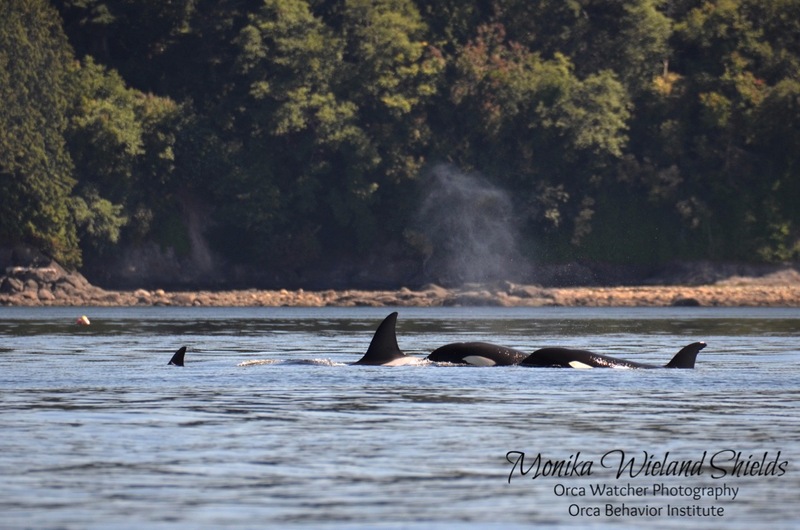 Shortly thereafter they did make a kill near White Rock. 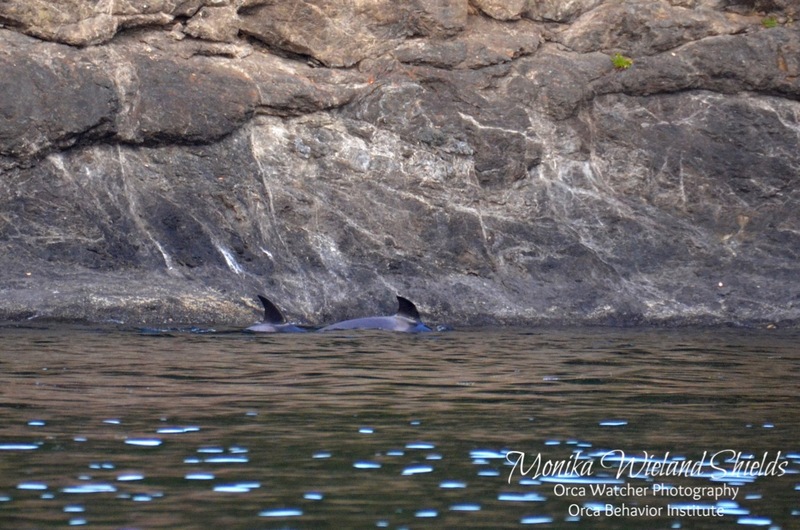 It was amazing how close they surfaced to these rocks as a group of wide-eyed harbor seals looked on! Before we departed, we saw these whales give a close pass to the local sailing ship the Spike Africa. Then on Sunday it looked as if we might go a day without whales when a group of Ts was picked up nearby heading our direction. We caught up with the T37As off Henry Island on the evening of July 16th. This group is made up of mom T37A (mother of the young dispersed whale T37A1) and the three of her offspring that travel with her. She's a very successful young mother, at age 23 having already given birth to 4 surviving offspring. 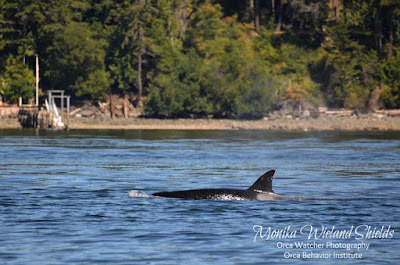 I wonder if her birth rate of a new calf every 2-3 years has anything to do with her oldest dispersing so young. 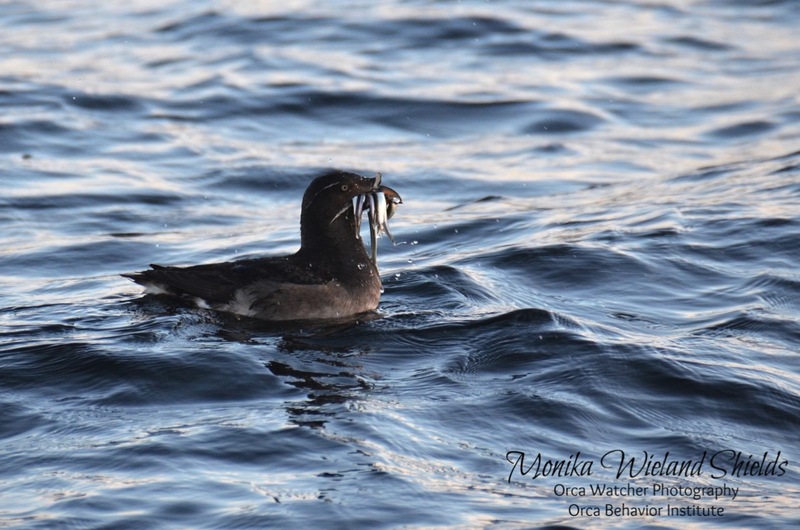 At any rate, she's got her work cut out for her as the only adult and a family of 4 to feed! 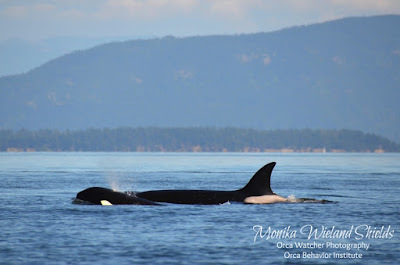 At first all 4 whales were traveling together, but soon mom and her oldest non-dispersed offspring completely disappeared for 15 minutes while the two youngest - four year-old T37A3 and two year-old T37A4 played together at the surface. It was like she left them to entertain themselves while going hunting! 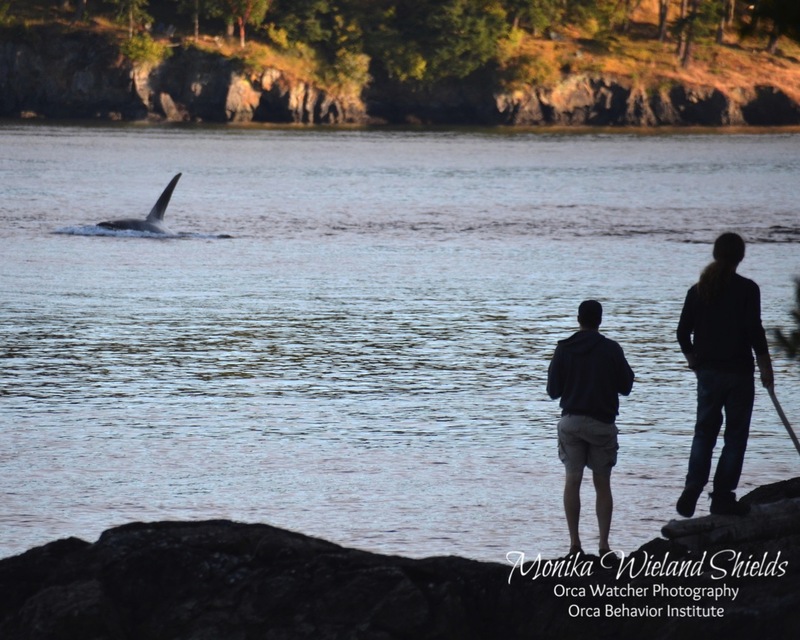 No mom in sight while these two little ones frolicked right off the shoreline of Henry Island - so close to shore it looked like they were practically touching the rocks! 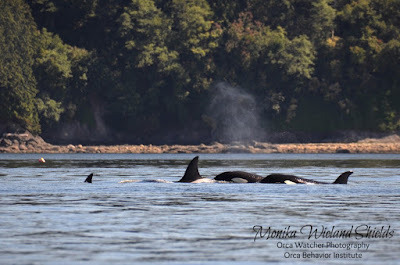 Eventually mom did come back to pick them up, and the family booked it over to Open Bay, where they again stalled out. It wasn't clear what they were doing as they were loose and surfacing every which way, looking more like the residents that often forage in this same location. 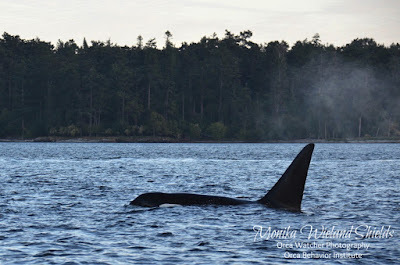 I have a feeling we're in for some more transient killer whale encounters in the near future, but next the Southern Residents finally returned to inland waters after a 17 day absence when, on July 17th, part of L-Pod made their way in. 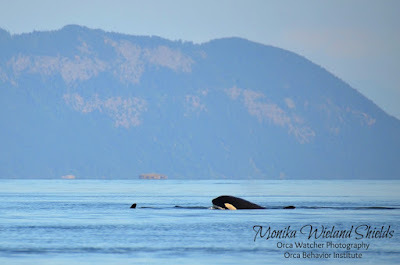 Their stay was short, but we did get to see them - those photos in my next blog post!